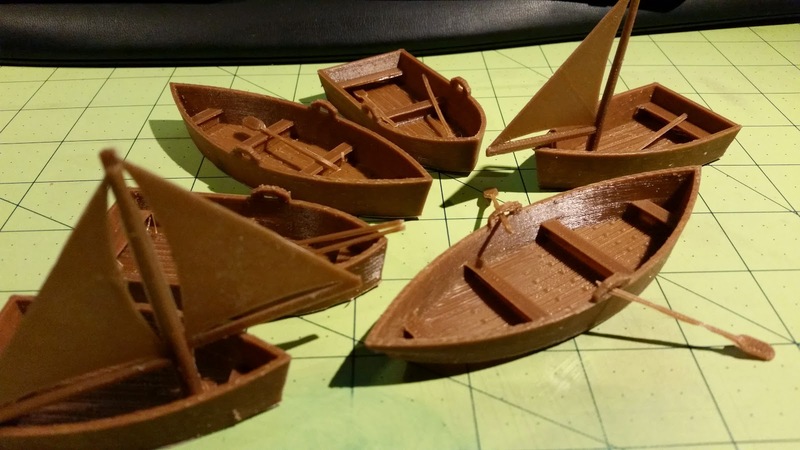 d4d6d8d10d12d20: 3D Printing : Row, Row, Row Yer Boat! 3D Printing : Row, Row, Row Yer Boat! For the pirate campaign i'm currently playing in I decided to print out some row/sail boats for use. These are from the open forge project on thingiverse and can be found here. These are fresh off the printer with minimal clean up, If you so choose you can paint them up or at the very least use a bit of black wash to bring out more of the details and deepen the shadows. d4d6d8d10d12d20 by David Clunie is licensed under a Creative Commons Attribution-NonCommercial-NoDerivs 3.0 Unported License. Based on a work at www.d4d6d8d10d20.com. Permissions beyond the scope of this license may be available at http://www.d4d6d8d10d12d20.com/p/contact.html.